Shopping for your first car seat can be challenging. It’s what’s going to keep your kids safe while traveling and–heaven forbid–during an accident. But with so many options out there on the market, it can be confusing. What should you be looking for in a first car seat? Here are some pointers for choosing the best car seat possible. 1. Second Hand Or Brand New? Car seats can be expensive. That’s why many parents look around for second-hand options. What’s the point of buying a new infant car seat when it will soon need to be replaced anyway? It turns out that there are some reasons to choose a new over a used seat, with the main reason being safety. Many experts recommend that parents never buy second-hand car seats. The reason for this is that there is no guarantee that the seat hasn’t been involved in a crash and isn’t damaged. The problem with many car seats is that the damage isn’t apparent from the outside. Usually, you only find out about problems after you’ve been in an accident, by which time it’s too late. All car seats have to pass the JPMA safety standards. But because these standards are continually being updated, newer seats are often better. They employ the latest technology based on the most recent research. Bottom line: stay on the safe side and make sure you always buy car seats new. There’s a significant variation in the price of car seats. Most seats at the top of the market have five point harnesses, but some at the lower end–between $80 and $200–don’t. Should you be concerned? According to experts, you should always choose a car seat model with a five-point harness. Five point harnesses comprise two waist straps, a strap between the leg, and two shoulder straps. The reason they are so important is that they help to distribute pressure across an infant’s entire torso during an episode of extreme deceleration, preventing harm. 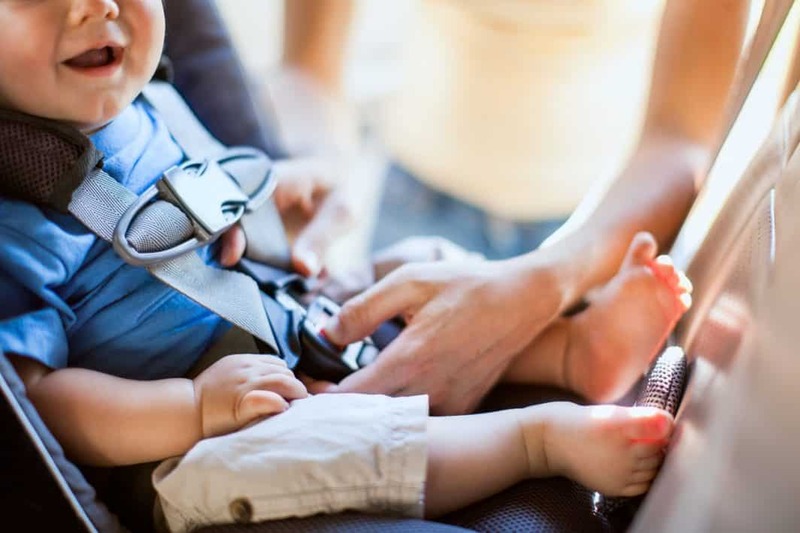 Good baby seat models come with the LATCH system – a type of base fastening system that doesn’t require a seatbelt – so look out for this on product descriptions. Babies grow quickly. The typical baby doubles in size once every 180 days–sometimes fewer! Because of this, you want a baby seat that can grow with your child. Diono car seats, for instance, are highly adaptable, featuring adjustable headrests that have twelve positions as well as adjustable shoulder and buckle positions. Many car seats are both height and width adjustable, meaning that you don’t have to go back to the store every six months to buy a new one. For parents, an uncomfortable child in the back seat can be a nightmare. Not only can it be stressful, but it can also distract from the road, increasing the chances of a collision. Anything, therefore, that can reduce the likelihood of a child complaining is beneficial. Different car seats offer varying levels of comfort. Some manufacturers don’t focus on it because they don’t think it’s important, but others do. Look for seats on the market that are highly adjustable to your child’s size. In particular, look for models with movable shoulder positions. Also, choose the highest quality, most comfortable materials you can afford. Paying more for a car seat should get you additional features, but that’s no guarantee. If you pay more than $200 for a car seat, there are some minimum specifications you should expect. The first, and perhaps the most important is an anti-rebound bar. Anti-rebound bars were first implemented to limit the movement of the car seat during crashes. Since then they’ve become a standard feature of premium models. The other important features from a safety perspective is a steel frame. Higher-end car seats tend to have sturdier steel frames which offer a higher degree of protection during an impact. Of course, there are plenty of additional ways manufacturers add value to more expensive seats. Pricier models often come with higher-quality, plusher fabrics, baby storage bags and large canopies: practical, but not essential. Although you might think that a child seat would be a permanent fixture in the back of your car, it usually isn’t. There will be occasions when you have to give friends and family a ride without the baby. As a result, you want baby seats to be portable and easy to remove and stow in the trunk. Look out for models which have handy features that make them more portable and family-friendly. Owner of SugarBabies and mom to three wonderful kids.